(CNN) –- Actor and sustainable housing advocate Brad Pitt brought his pitch to the nation’s capital Thursday, meeting with President Obama at the White House and Speaker Nancy Pelosi on Capitol Hill. After a brief stop by the executive mansion to meet with the president and his climate czar, Pitt met with Pelosi in her Capitol office to share details of his charity housing efforts in New Orleans. One thing’s for sure: policy conferences on the Hill don’t usually pull out a crowd like this. A throng of giggling fans, mostly female, gathered to catch a glimpse of "The Curious Case of Benjamin Button" star as he posed for pictures following their meeting. “It really is an honor to have him here and I know for some of my staff, and for bragging rights for my children and grandchildren, a real treat for me as well,” she said. Pelosi, posing with Pitt and South Carolina Rep. James Clyburn at the congressional photo-op following their meeting, said the actor had been telling her about how the homes his foundation has built built to a "green standard," with utility bills of less than $10 a month. The actor’s foundation, "Make it Right," works to construct sustainable housing for low-income residents in New Orleans who lost their homes in Hurricane Katrina. Launched in 2007, Pitt's project focuses on NOLA's Lower Ninth Ward, a region ravaged by the 2005 hurricane. Pitt shares a home in the French Quarter with his girlfriend, actress Angelina Jolie. “I just want to say thank you to the Speaker for opening up the doors for us to come in and discuss the rebuilding efforts, the current rebuilding efforts going on in New Orleans, and to how we can expand this idea of affordability and sustainability which we think we have a model that works," Pitt said, amid a flurry of camera flashes. Only the diitoheads and rabid right could find so many complaints about the good works of one person helping others. It would be nice if you found inspiration in his example and stopped thinking about all you own selfish whining.. Guess that is too much to expect from a crowd that is so shallow and self-absorbed. How much charitable work has $ 100 million Rush, done? (Donating to far right wing wackos doesn't count). Shame on you Sarah Parker!!! Brad Pitt and Angeline Lolie share lives, have children together, share goals and do work together that benefits others....and you refer to her as his girlfriend and/or companion. You are a writer...pay attention to the use of your terms....How more denegrating could you have been in referring the the female partner in a partnership !!! I like Brad, He seems to do a lot of good things. Certainly can't knock the guy for caring about others and not being all about himself! Most Hollywood types are extremely self absorbed and wouldn't even think about doing some of the things he's done for others! First Clooney and now Brad Pitt! It's amazing who gets the President's ear. What about the rest of us? Will we get an invite to the White House to share our views? I am disgusted by all these ridiculous photo ops! How many other people are doing something th really help the people like this? He dosen't have to to this...He WANTS to something, and IS doing something. So instead of the mocking of those who want to help improve the lives of those whose needs are great, why not offer whatever skills you have, get out there and do something...There's plenty to do. And who knows you might feel better about yourself. Good job in N.O. Mr. Pitt. Now show some respect and button your shirt. This is exactly what we need people to get together and work for a greater America to help each other, let's roll up our sleeves and work hard, if all of us stick together we will prevail. This is great, people like Pitt and Clooney, and regular people just helping each other. Thank you President Barack Obama, we are going to make it. Hey there you go ; an adviser of outstanding import and credentials ! We shall all swoon now !! Great job, and you know they just could use a little more of you in the kentucky Blueridge Mountains. thanks for all the work, it makes me proud you stepped up to the plate. 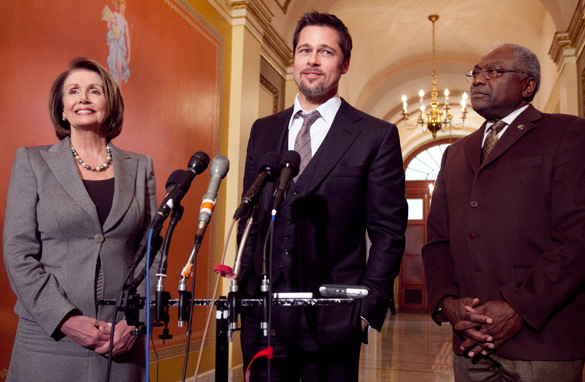 Brad Pitt needs to stay out of politics. His family is a disgrace to the nation. Why not adopt kids from your own country that need help? We have starving children too ya know. Don't forgot, Angelina is such a great role model though, I mean, look at Octo-mom. Pelosi is not going to get reallected at the rate she is going. That will be the best thing that has happend to the President. I always said that it would be the left that brings him down. Oink, Oink. stop the Bill in the Senate, before it ruins the presidency of Barack Obama. Brad should be able to straighten everything out in short order. He's got that "genius" look about him. Did he bring his wife,,,she could show the O man her tats. He can put them in charge of FEMA since they are hanging out in New Orleans anyway. wow.......repugs actuallly dismissing someone who's helping out the country......just goes to show you were their priorities are.......america it's time for you guys to stand up to this non-sense from the right and stick it to them......you guys won and should lead the country as you see fit and not as the repugs see the world...............thru the eyes of douche bag limbaugh..............come on america i know you can do it......if not for yourselfs..........do it for future generations. Brad is doing an admirable job and it's great to see people with resources working towards goals that make differences in other people's live. Disclaimers aside, I felt like throwing up at the thought of our highest levels of politicians wasting time being enamored by Benajmin Button. What in the hell makes them think that NOW is a good time to waste time entertaining celebrities for "bragging rights"? Don't they have a damned "to-do" list? Joey: Brad and Angelina can adopt children from wherever in the world they choose to do so. Although some of their children are from foreign lands, they represent the changing face of America. It's called diversity. Who cares about this fluff? A washed-up pretty boy philanderer and a bunch of fat cats talking about what? The real deal is that the Obama administration in cahoots with the Congress and Senate including Republicans are leading this country to one world economy by deliberately adopting policies designed to kill off personal wealth. They destroyed the real estate and financial markets and are targeting tax havens. Now you poor slobs may think that it's all well and good to hate the rich, but they are your employers dimwits! Say your prayers fools and stop guzzling the kool-aid. @Indy,Jumboand joey from sd are you Idiots Related ?? Who is the biggest actor/actress in this picture? Pukelosi wins hands down – she pretends to care about America all the time and we all know it is a lie but she just keeps on pretending. pitt is just there for more free publicity. In case your brain can't comprehend...Hollywood already took over the white house back when Reagan was elected. After all he WAS an actor you know. You know...the former president that you all love to place on a pedestal. Oh and let us not forget AHNOLD, the Republican Terminator...I mean governor. It's funny how republicans can somehow ignore those facts when dogging celebrities.